Next post: Good Measure Quilting Rulers! My favorite sewing notion is my little seam roller. It’s the perfect little tool to make my seams lay flat while I’m piecing. My can’t do without notion is my rotary cutter! I was quilting way back when we used templates and scissors. Never again! Tough choice, but I couldn’t live without my Bernina #10 edge stitch foot. I have to say my seam ripper – because I use it so often! Lovely quilt. I love the colors. My favorite sewing notion is The Jinny Breyer Perfect Piecer. I am amazed at how much this little notion has helped me mark correct angles and measurements. I just love, love, love the bright fabrics you’ve used in Technicolor. Ps. Thanks for the Rulerwork Quilt Along! My favorite notion is my little Famore snips for cutting threads! I can’t sew without them. I honestly could not live without my needle threader. I just can’t see to thread a needle anymore! My Bernina quilting foot is awesome! My rotary cutter. I have no patience for scissors anymore! My most used and possibly the most favorite would have to be my rotary cutter. It the best invention ever made! I remember my first quilt, we used fine sandpaper to make the patterns! If we still had to that, I think I would have given up on quilting years ago. Fortunately, I am a quilter and I love my hobby! I would have to say my favorite is the rotary cutter. The quilt is absolutely stunning! I have two maybe three favorite notions…….I love my wool ironing mat. Makes a world of difference when ironing pieced blocks…….I love me a good rotary cutter and lastly……I LOVE my rulers!! My favorite notion would have to be my small 1” x 6” ruler. I use it all the time to measure my seam allowances and to make small cuts using a rotary cutter. sewing table organizer. Then when I want to cut threads they are so handy ! My sewing machine’s quarter inch foot! I finally found an accurate one for my Brother Dream Maker. 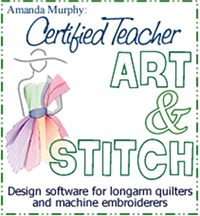 Really love your free motion quilting teaching. Thanks much. I have 3 favorites: my 1/4″ foot, my seam ripper, and my little Gingher scissors. Amanda, I love this quilt and the colors really make it, pop. I’d like to give a different answer, but have to go with the majority and say that it’s my Rotary Cutter. I love having my tweezers nearby when doing quilting using a walking foot or the BSR. They make it so easy to pull up the bobbin thread quickly! My favorite is my rotary cutter too! My favorite quilting tool has got to be my straight line ruler. I use it all the time while quilting. Love that quilt! My favorite notion – hmmmm….. I love my seam roller – it saves me so much time, since my ironing board is across the room (on purpose so that I keep moving, lol.) I can get away with a few quick presses with the roller between trips to the ironing board. My Purple Thang! When someone gave it to me as a gift, I thoought I would never use it. Turns out it can be a stiletto, a point turner, a seam smoother, etc.! Luminous indeed! I love this one! While not my favorite my often used tool is the seam ripper. My favorite might have to be my rotary cutter because that means I’m busy creating. My wool ironing mat and my little go iron right beside the sewing machine. I love a good pair of snips…! I love, love love the technicolor quilt. My new favorite notion is my pincushion with a wrist strap. I love fabric–all colors and types! I know that technically fabric isn’t a notion, but without it we would not be quilting! As far as a true notion goes, I love scissors and a good rotary cutter. My favorite notion is my pair of thread sniper scissors. My favorite notion is a pair of very large Wiss scissors my parents bought me before rotoray cutters. Alas, my Bernina seam ripper. As ye sew, so shall ye rip. So many to choose from, because it depends on what project you are doing at the moment. But my favorite, for now, is my rotary cutter/ruler combo. It sure saves your hands and wrists from getting tired when you are cutting out many, many strips. Wedge rulers/templates are hard to find! Thank you! My color wheel is my number one favorite notion! My stiletto!!! Can’t piece without it. Beautiful quilt! It is amazing how colors change the look. You are so creative! Starch! It makes the fabric easy to cut and sew. Plus, there is less fraying with the quilt blocks. My favorite notion is the rotary cutter. Love the quilt colors! I could not live without having my rotary cutter! I remember cutting them with a template. No more. Definitely my sewing machines-never would finish anything if I had to sew by hand! I use my wooden wallpaper seam roller a lot while I’m paper piecing. I just love it! Your quilt is really gorgeous! Beautiful quilt. Thank you for the give away. My favorite notion is my Great Aunt Arah’s thimble. It fits so perfectly that I have even taken it to the local jeweler to have the silver repaired on the end of it when I wore holes in it. I never got to meet her, but have always felt like I had a special bond with her. Thank you also for checking into the blocks here. I couldn’t do without my curved tip scissors to snip all my threads! I love those scissors! Thank you for the giveaway! My favorite sewing notion would be my Olfa rotary cutter. Love the Technicolor quilt! 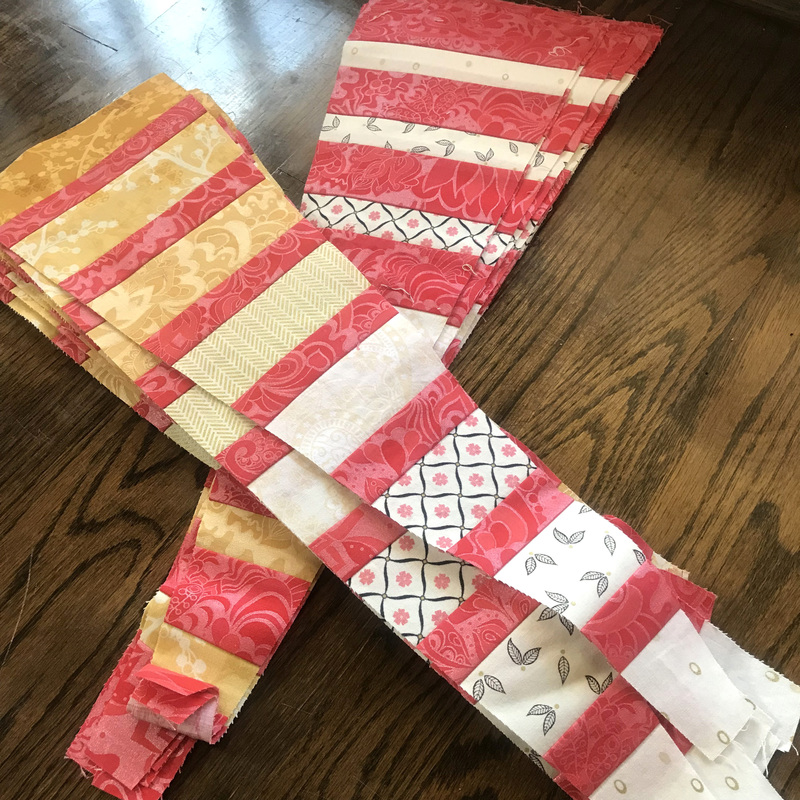 My favorite quilting accessory is the quilting foot..
My favorite tool is the stripology ruler because I can take my leftover fabrics from my favorite lines and strip it up or cut precuts quickly for another project. Love the jubilee line. Looking forward to finding it in stores. Definitely my stich ripper that my friends husband made us….just the right weight and big enough I don’t loose it! Couldn’t live without my ergonomic rotary cutter. Love both versions of your quilt and would love to win the alternate wedges to make one of my own. I use a small needle holder for putting new machine needles into my sewing machine–it is a lifesaver for me since my fingers do not work as well as they use to. My favorite sewing notion will always be my rotary cutter. I tried quilting years ago before rotary cutters and I just found it to be too much work cutting everything out piece by piece with scissors. 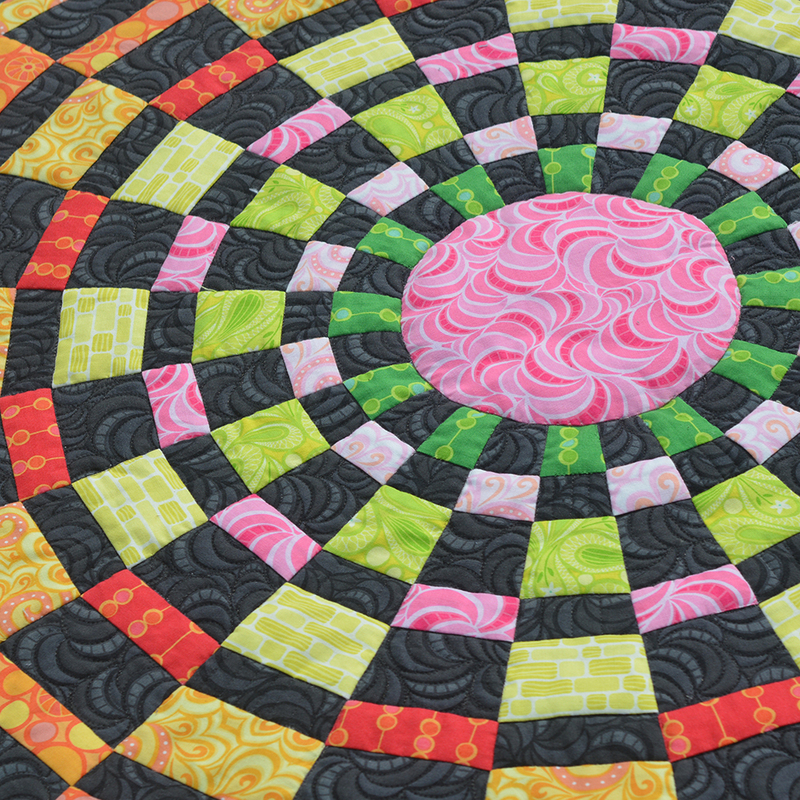 Your quilt is beautiful and you are right a different colorway gives it a totally different look. My favorite notion is the coin looking nail threader. Oldie ,but a goodie! Stunning quilt! I love my clover clips! But probably couldn’t live without my trusty seam ripper/stiletto combo. 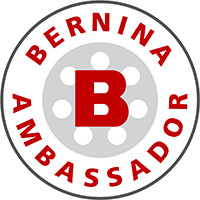 My favorite sewing notion would have to be my Bernina 750QE. Ok, maybe it isn’t a notion, but seriously, it’s my favorite! My favorite notion is the magnetic pin cushion where the pins all fall to the outside and straighten up, it is the best thing ever plus I have it in purple my favorite color! My favorite right now is my wool pressing mat. I think my blocks are flatter since I started using it. I use my stilleto nearly every time I sit at my sewing machine. It is one of my favorite tools. I could not quilt without my quilting rulers. Need a design, there’s a ruler for that! My favorite notion is my 6″ strip cutting ruler. Makes cutting those 2 1/2″ strips so easy and it’s great for borders too! My favorite sewing notion is the rotary cutter. Sad to say it’s my seam ripper(s). I have a few so that when I need it, there’s one close by! My favorite notions are my small very sharp scissors that never leave the side of my ma home and my small 3 x12” ruler – these items are always close at hand. The two colorways,on “Technicolor” are amazing. 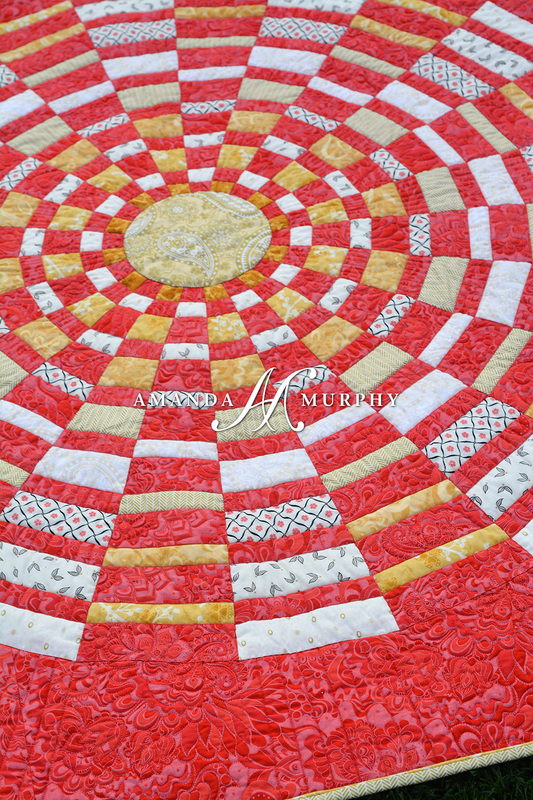 I love the Quilter’s Select rulers! No slipping – no kidding! I love my new Reliant iron. It puts out so much steam, I have to be careful not to burn my fingers! AND I can turn off the auto shut off feature so I’m not always waiting for the iron to warm up. The Add-a-Quarter ruler is really useful when I’m doing a paper piecing project. And I use my Clover clips quite often. My favorite quilting tool is my Quilter’s Select ruler because of the non-slip film on the back. It makes cutting so much easier. I love the quilt! Love the Quilter’s Select rulers with their non slide backing. Love your quilt! I love my little Tooltron snips. They save me so much time. My bestest piecing friend is Elmers glue. I seem to prick myself with pins. Love this quilt! Hard to pick a fave tool. It would probably be the 97D foot & guide. I mostly piece, but learning fmq. I have a beautiful seam ripper made by a friend husband. Thoughtful gift and extremely useful. It is hard to choose just one but I would say my ruler. Couldn’t put pieces together without precise measuring! Lovely quilt. My favorite notion is my seam ripper. What a fun quilt! Beautiful quilting job. My favorite notion is my LED lamp! So bright and allows me to see everything. The seam ripper! Even though I have been sewing for years, “stuff” happens where I need to rip out some stitches. Without the seam ripper, it would be difficult to do. Lots of other great tools but this one is tried and true. My favorite sewing notion is my Elna sewing machine! 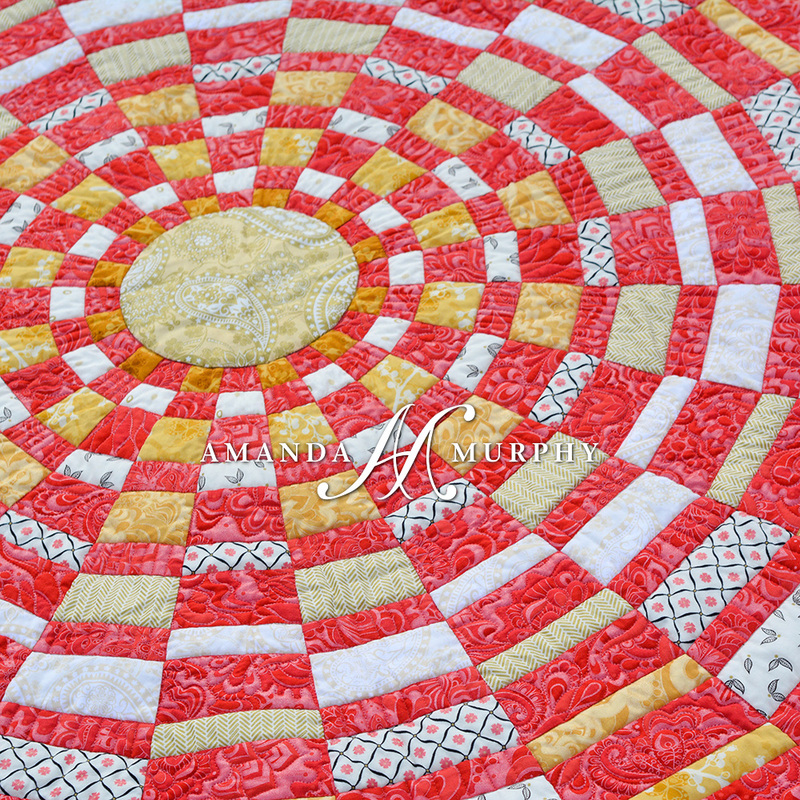 My favorite is my weighted rotary cutter….the weight makes it easier for me. The next is my seam ripper….which is used frequently ! My favorite Quilting Notion is my Credit/Debit Card!! 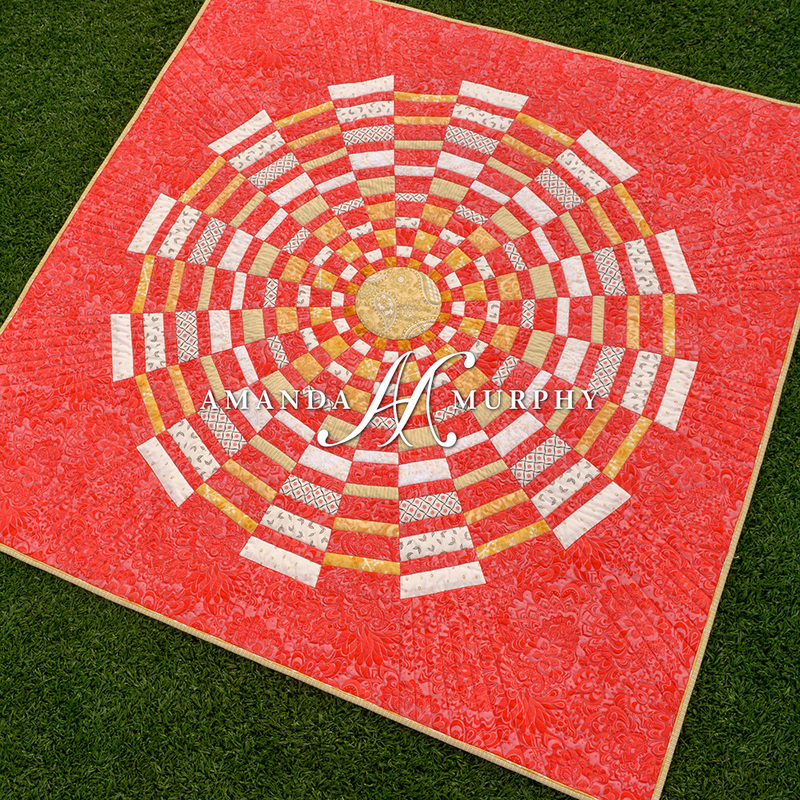 My favorite notion is my little rotary cutter… It helps in unsewing…. which i have gotten pretty good at, unfortunately. GREAT quilt and what a fabulous way to do 2 at once!!! I LOVE my stiletto/finger press tool from “ByAnnie”. Couldn’t live without it!!!! My favorite would be a seam ripper, any kind, as long as it is sharp. This says a lot about my sewing. 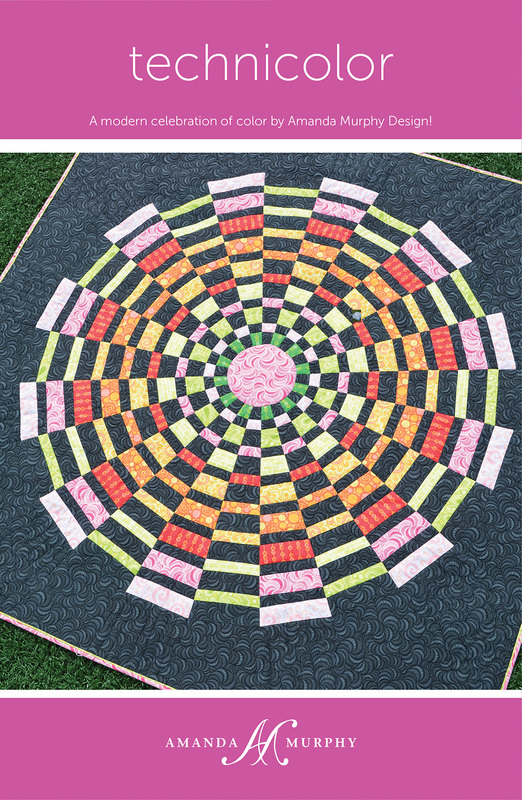 What beautiful and energetic quilts! Thank you for the opportunity to win the leftover wedges! One of my favorite notions would have to be my 1/4 inch foot; too much trimming of blocks slows me down! Gorgeous quilt, the navy really makes the colors shine. Yes I want to make a couple of your Technicolor quilts. My favorite sewing tools are the 1/4″ sewing foot, a stiletto, tweezers, and a lint roller. Thanks for giveaway. My favorite notion is my Kai scissors, They are perfect for snipping and tiny and precise for cutting around applique. Wow! Your work is truly amazing. I love my rotary cutter & rulers. My favorite sewing notions are my array of rotary cutters. If you every cut patches with a scissors, you know how wonderful they are. Well, ahem…my seam ripper! Love it! I definitely want to make this one! My favorite tool is non slip rulers. My favourite has to be my actual bern8na 125 Anniversary machine. My favorite tool(s) are my quilting rulers for piecing and my quilting rulers for quilting with my Bernina Q20. I glue small squares of the spongy shelf paper to their backs to keep them from sliding. My favorite is the sewing nippers that belonged to my mother. I use them extensively and they remind me of my mother who sewed most of my clothes when I was growing up. My favorite tool for quilting is the rotary cutter. I would pick my rotary cutter. My rotating cutting mat is something I couldn’t be without. Beautiful quilt! My favorite sewing notion is my tweezers that came with my serger. I use them for everything from pulling tiny thread pieces out of the machine to grabbing a piece of lint or any small thing that is in a peculiar place or that my fingers can’t reach. I never sit down to my machine without my tweezers and I guard them with my life, even to the point of traveling with another pair so I always have my original ones. The neck is the perfect angle and they have rescued me soooo many times I just can’t see sewing without them! Beautiful quilt! I love the red! My forever favorites are all listed above, but my newest favorite is my wool pressing mat. So fun to use! My favorite quilting tool is the stiletto. I can’t sew without it but second would be the seam ripper. Although, I really hate when I have to use it, lol. My favorite notion is…my Matilda’s Own rotating mat/table. I held off buying it for so long, and even bought 2 other kinds of rotating cutters mats, but I finally gave in! Why did I wait so long??? I know this doesn’t count as a sewing notion, but I really cannot live without this item. I keep a pair or two of very strong reading glasses near my machines. I wear contacts or glasses, but sometimes, there is a need to have super vision. I cannot always see the tiny details, and having a strong pair of glasses helps to diagnose exactly what is going on with those tiny stitches, or finding those tiny bits of thread stuck in the bobbin case. Since the reading glasses I have are strong, I end up with my nose pressed up to the machine or my work. It is like having a hands free magnifying glass. They aren’t always necessary, but when an issue arises, they are great to have on hand. My favorite notion is my little Creative Grid 2.5 X 6.5 inch ruler. I use it for EVERYTHING! If I misplace it for a moment, I panic! Can’t live without it. I see that lots of folks said their rotary cutter… well, that’s a given! (So I must have 2 favorites!) Love the quilt, would love the pieces! This is a beautiful quilt. I would love to win the extras. My favorite sewing tool is my WOOL PRESSING MAT. My Tool Tron thread snips are my favorite sewing notion. I love your quilt in both of your fabric choices! There are so many notions that have become standards that it’s hard to say which is my favorite! Once you become accustomed to using something it’s hard to say no I don’t need that! I mean really who doesn’t need that rotary cutter, the cutting mat and the nonslip rulers? And not sewing with a 1/4 foot is almost unheard of!! The seam ripper is a necessity as is using good thread like aurifil( which is all I use now!) So my one favorite? All of them!!! Thanks for sharing pictures of your quilt! Love this one! WoW! Your quilt is gorgeous! My favorite notion is my 2 1/2” X 6 1/2” ruler. It’s the perfect size for my hand sewing projects and fits great into my project bag. the notion i can’t live without are my fricxion pens. love them! My favorite notion is my fiskar’s scissors…both the small and regular size. With physical issues that pop up, it helps to have something larger to grip and hold on to. Thank you so much Amanda! This is going to be fun!